TNT Express has recently chosen Van Zwitserland BV as a partner in the design of the new fleet for the Benelux. Almost 200 Mercedes-Benz Sprinters if which 14 with a transporter loading bridge are equipped with camera systems from Van Zwitserland BV. TNT Express is the European leader in global courier and express services for the business market and needs no further introduction. In the tender, the emphasis was placed on the placement / installation capabilities of the monitor. 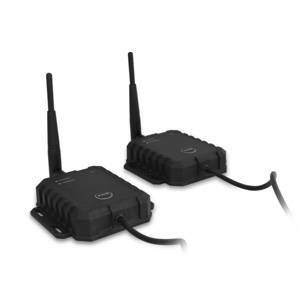 Night vision and overall image quality is important for the camera. Following the invitation van Zwitserland has proposed to set up a test vehicle. 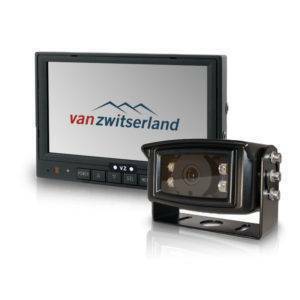 Van Zwitserland decided to place a 5″ LCD colour monitor in place of the inner mirror combined with a heated colour rear view camera with CCD lens. After extensive testing by drivers and workshop employees the offer from Van Zwitserland proved to be the best option. According to TNT Express the combination of products, quality and attractive pricing, made the difference. The waste management company Van Gansewinkel Group has chosen as part of a staff reduction project van Zwitserland BV as the supplier of camera systems. The objective was to operate the vehicle with only one driver and to automatically hook on the bins from now on. 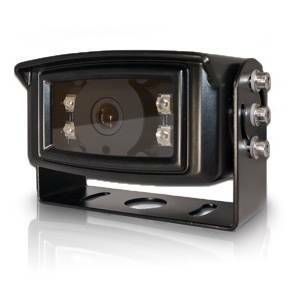 To comply with the European safety standard BS EN1501 the garbage trucks are fitted with a back-up camera. Nearly 80, especially DAF CF75, garbage trucks were also equipped with a blind spot camera. Van Zwitserland BV didn’t only deliver the (custom-made) products, but also took care of the complete installation and after service. Following the initial procurement, three major camera suppliers including Van Zwitserland where allowed to set up a DAF CF75 as a test vehicle. Main pillars in the tender were image quality, installation, robustness and price. Since during the project it showed that it was quite a challenge for the driver to drive exactly to the middle of the bins Van Zwitserland has developed software which creates a green line in the middle which indicates the ideal drive line. Moreover, Van Gansewinkel picked a heated and extra robust camera with an extra wide lens so the automatically hooking on of the bins was in view too. The efficient imaging of hooking on the bins in combination with the visualized ideal drive line proved to be a hit, this won the contract. Both the flexibility and the speed of development and approach surprised Van Gansewinkel. The competitive pricing for both the products and the installation made the offer complete.